BROWNSBURG, Ind. 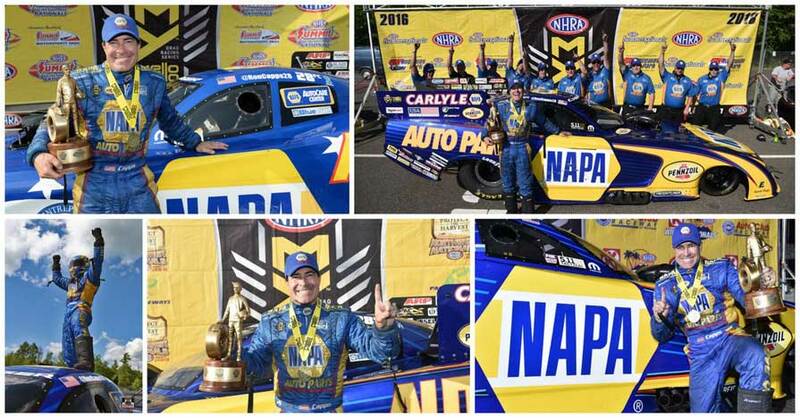 (Sept. 14, 2016) – Ron Capps and the NAPA AUTO PARTS Dodge Charger R/T Funny Car team led by crew chief Rahn Tobler opens the six-race NHRA Countdown to the Championship playoff Friday near Charlotte as the No. 1 seed with a 30-point lead. 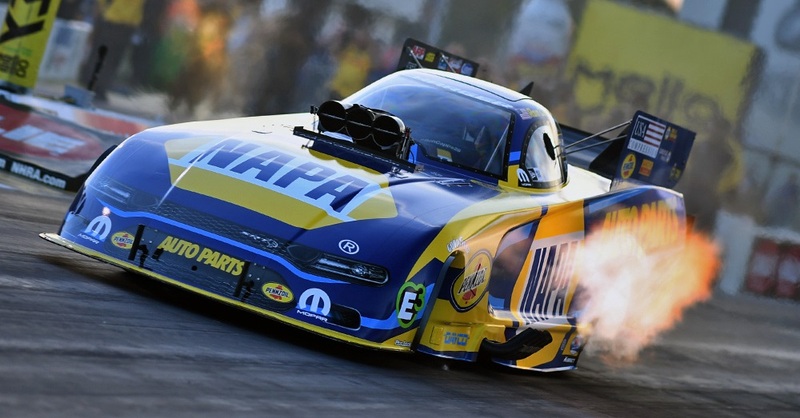 It won’t matter that Capps finished the 18-race regular season in the Mello Yello Drag Racing Series with a 202-point lead over the field with a category-best five event titles, eight final rounds and four No. 1 qualifying positions that tied him with Don Schumacher Racing teammate Jack Beckman for the most this year. The yearlong season that traversed the country is down to six races, a scheduled 24 qualifying sessions and as many as 24 rounds of eliminations. When racing begins on Friday, points for the Countdown will have been reset for the 10 qualified drivers and Capps’ lead will have been whittled to 30. The question the veteran driver living near San Diego will face most during the 10th annual Countdown is about having not won a season championship despite being runner-up four times, the most ever in the sport. 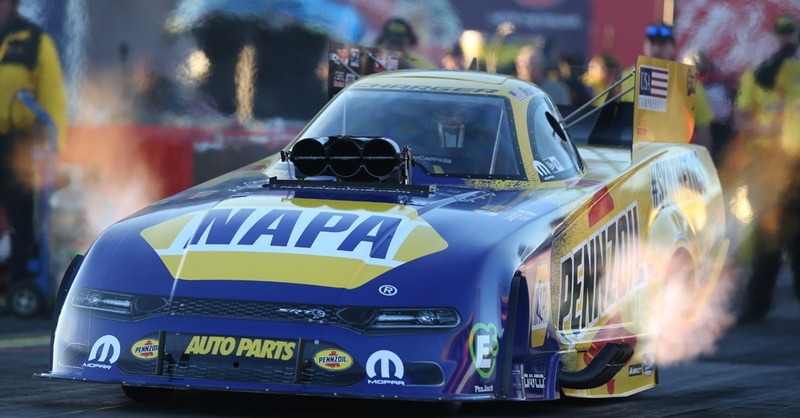 “It doesn’t weigh on me,” said Capps, who owns 50 NHRA event titles including 49 in Funny Car. “I’m OK with it. I started in this sport as a crew guy and worked my way up. I’m the American dream, if you will. I wanted to drive someday, but had to start from the very bottom wiping tires. I had people let me hang around their cars and learn and worked my way into a driver job. “I’ve done it for a living. I have a house and a family that this sport of NHRA has given me. “Since the very beginning, I’ve done it for the love of just racing, driving a racecar. I never sat down as a kid, and thought that someday I’m going to be a world champion. I never thought about being a Mello Yello champion. I just wanted to be a racecar driver and I wanted to drive a Funny Car. 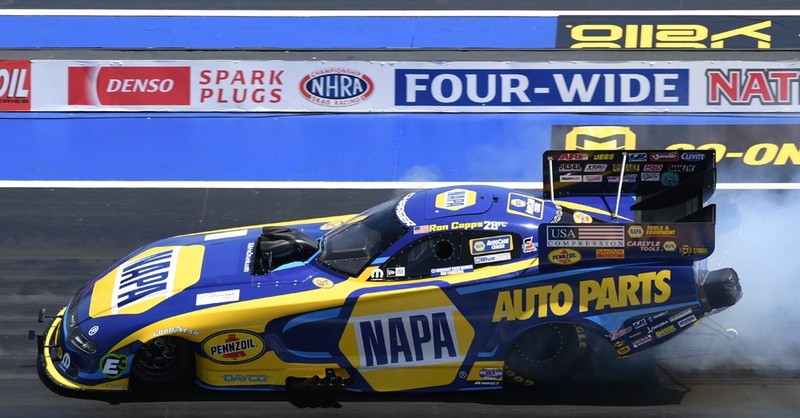 Capps has finished second in the final standings by as few as record two points in the Countdown era in 2012 and the slimmest margin ever of eight before the playoff system was instituted. “You’re going to need to probably reach semifinals, at least, throughout the Countdown. You might be able to have a hiccup here and a hiccup there, maybe have a (loss in a) second round. But as we’ve seen in the past, there have been teams that have gone from fifth or worse to come alive and win races in the Countdown, gone on to have big wins near the end of the Countdown. 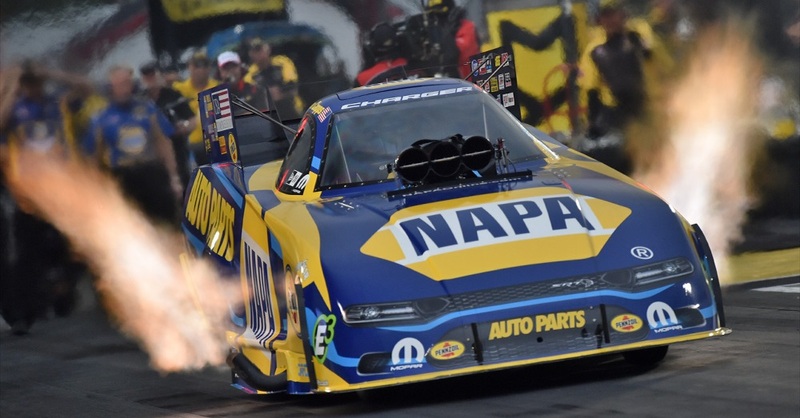 This weekend is the first of three Countdown races in three weeks, and the NAPA team was successful in June during a stretch of four consecutive races when it won three times in four final round finishes. “It’s an all-out fight starting in Charlotte,” Capps said.